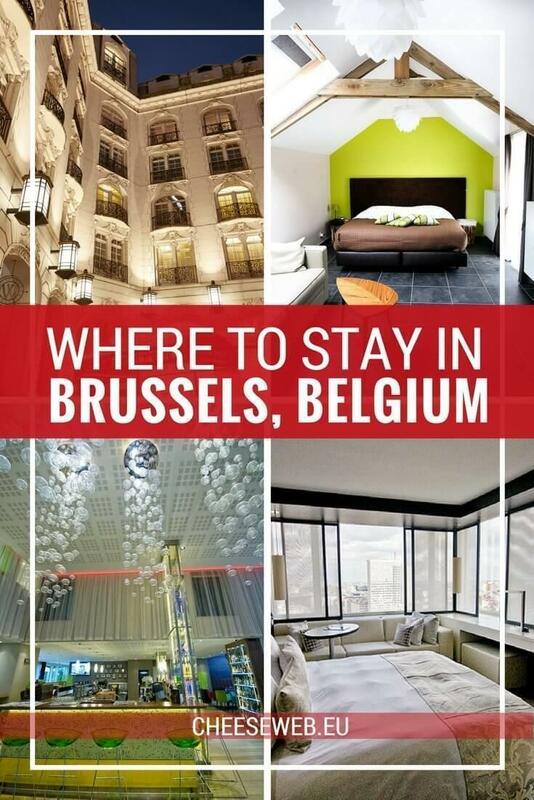 Whether you’re visiting Belgium for the first time or you need to recommend a hotel to visiting family, we tell you exactly where to stay in Brussels, Belgium. Brussels offers an extraordinary range of hotels from decadent luxury to extreme budget, and there are excellent choices at all price levels. However, there are also plenty of not-so-great options, and we’ve heard our share of hotel horror stories. That’s why we’ve weeded through hundreds of hotels to bring you the 30 best hotels in Brussels for all budgets styles of travel. Whether you’re staying in Brussels solo for a week of work, discovering the city on a family vacation, or enjoying a romantic getaway with your special someone, we have the perfect hotel in Brussels for you. We’ve sorted the top hotels in Brussels by category, but most hotels are suitable for a variety of reasons, so we’ve created a table to help you find exactly what you’re looking for. We also mention the area of Brussels where you’ll find the hotels. If you’d like to know a bit more about the different neighbourhoods, read this article, to figure out which area is right for you. At the end of this article, you’ll find a map of the top 30 hotels, so you can see exactly where they are located. Spa – Sauna, Hammam, etc. Let’s begin with the best-of-the-best. If money is no object, you’re looking to impress someone special, or you just want to pamper yourself, one of these hotels is where you want to stay in Brussels. But don’t overlook them if you’re on a tighter budget as there are often great deals to be had on some of the top hotels, especially in the off-peak seasons. The Hotel near Brussels’ Avenue Louise offers a luxurious stay in chic Brussels. With a name like The Hotel, you would expect a luxurious place to stay, and you’d be right. Located near Avenue Louise, you’ll be in a prime location for high-end shopping, and you’ll enjoy one of the best views of Brussels from your room or the unbelievable glass-walled sauna. The Hotel is perfect for foodies with its stunning bar and tearoom and fabulous fine-dining restaurant. In fact, if I had to pick my overall favourite hotel in Brussels, it’s The Hotel. Click here for the latest prices. Read our full review of The Hotel. If money is not an option, the Rocco Forte Hotel Amigo is one of Brussels best addresses. This luxurious 5-star hotel is steps from Grand Place, near Central Station, and home to Ristorante Bocconi, one of Brussels top Italian restaurants. Location and luxury like this don’t come cheap, but if you want to be in the heart of the city, this is one hotel not to overlook. Click here for the latest prices. Another centrally located hotel offering a luxury stay but at a more affordable price is the Dominican. Deluxe rooms are often half the price of the Hotel Amigo and include free wi-fi and in-room Nespresso machines. It is slightly farther from Grand Place but on a quiet side street. The Dominican’s Lounge is beautiful and a hip place to see and be seen for 30-something Bruxellois crowd. Click here for the latest prices. 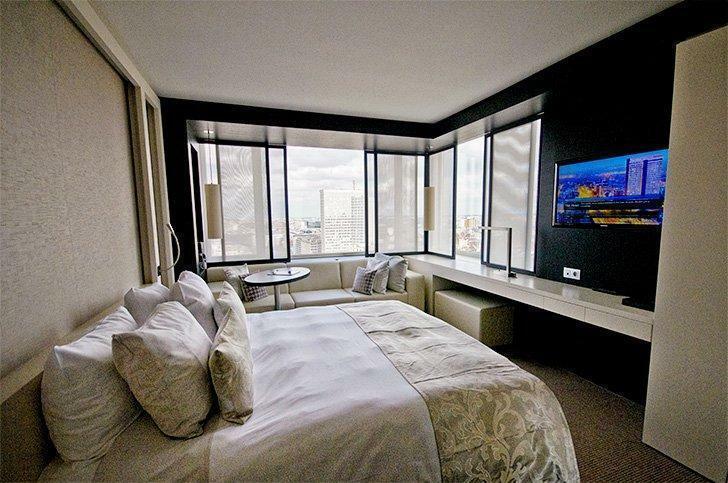 The Radisson Blu chain is known for its luxurious hotels around the world, and the Brussels property is no exception. Like Amigo and the Dominican, it is nestled in the heart of Brussels, close to Grand Place and Central Station. This is another great option for foodies as the Radisson owned Atrium Restaurant is excellent, and the hotel is also home to one of Brussels’ Michelin Starred restaurants – Sea Grill. Click here for the latest prices. Read our full review of the Radisson Blu Royal Hotel. Steigenberger Wiltcher’s 5 Star hotel in Brussels, on Avenue Louise. 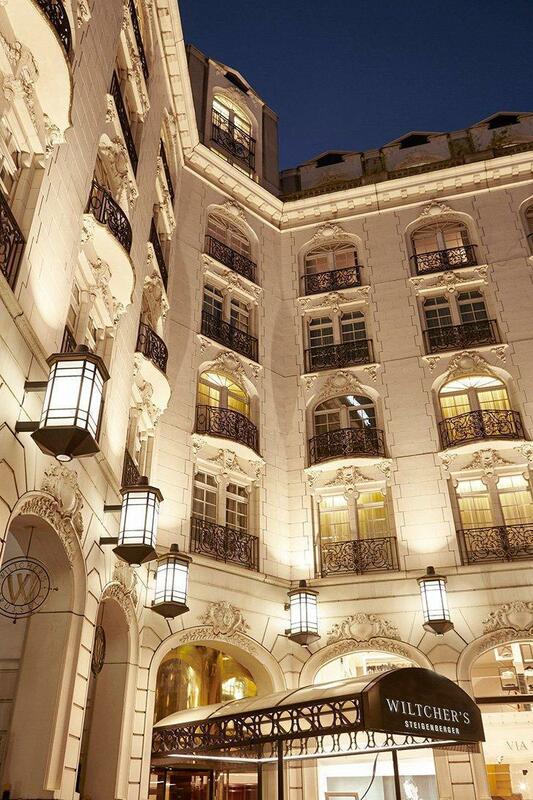 The Steigenberger Wiltcher’s Hotel is the Grande Dame of Brussels’ 5-Star Luxury hotels. However, a few years ago, this graceful old lady had a complete facelift. Now you’ll find a perfect mix of old-world elegance with an updated fashion sense. Like The Hotel, the Steigenberger is not located in Brussels’ central heart, but rather on the uber-fashionable Avenue Louise. The tram stops right in front of the hotel, and there is a metro stop just down the street for excellent transportation connections. You’re close to some of the city’s best restaurants, and the shopping is top notch. Click here for the latest prices. Also in the Avenue Louise area, you’ll find the Hotel Manos Premier. This 5-Star Luxury hotel has kept all of its old-world charms, including Louis XV and Louis XVI period furniture. However, it in no way feels dated, and you’ll find fun touches like the garden patio, dark and cosy lounge, and even an Arabian Nights-themed wellness centre and spa. This is a hotel for indulgence. Click here for the latest prices. Brussels luxury hotel Tangla with an Asian zen flair. The Tangla is one of Brussels’ newest 5-star luxury hotels. The hotel has a distinctly Asian vibe and boasts modern design according to the principles of Feng-Shui. Located near the Chinese Embassy and one of the city’s largest shopping centres, Tangla is equidistant from the airport and the city centre while still being in a green and quiet neighbourhood of Brussels. There is a full-service restaurant featuring Asian and Belgian cuisine, and you can even partake in an evening of Karaoke. Click here for the latest prices. Read our full review of the Tangla Hotel. With the growing impact of tourism on our environment more of us are concerned about the sustainability of the hotels we choose. Luckily, many of the hotels we’re recommending for other reasons are putting their best foot forward when it comes to issues of sustainability. Below you’ll find a list of Green Key listed hotels in Brussels. We wanted to draw particular attention to the Thon Hotel EU because it’s one of those hotels that ticks all the boxes and is an excellent hotel choice for just about anyone. It is our top pick for Green Key eco-label hotels in Brussels. It has a beautiful and modern design with comfortable, spacious rooms. Foodies will love the excellent breakfast buffet with locally sourced ingredients (including honey for the hotel’s rooftop beehive!). It’s conveniently located close to the EU institutions, but it’s also a short walk to the city centre and just up the street from the city’s main metro station. 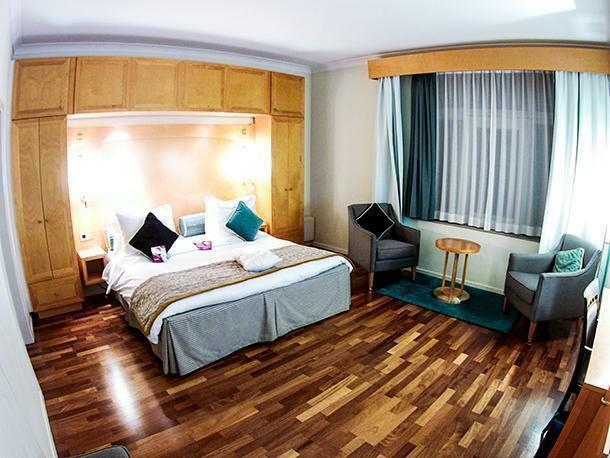 If you’re looking for a great all around hotel in Brussels that’s eco-friendly, The Thon Hotel EU is the hotel for you. Click here for the latest prices. Read our full review of the Thon Hotel EU. If you are an eco-conscious traveller but prefer a more intimate accommodation, B&B Living in Brûsel is your perfect choice. 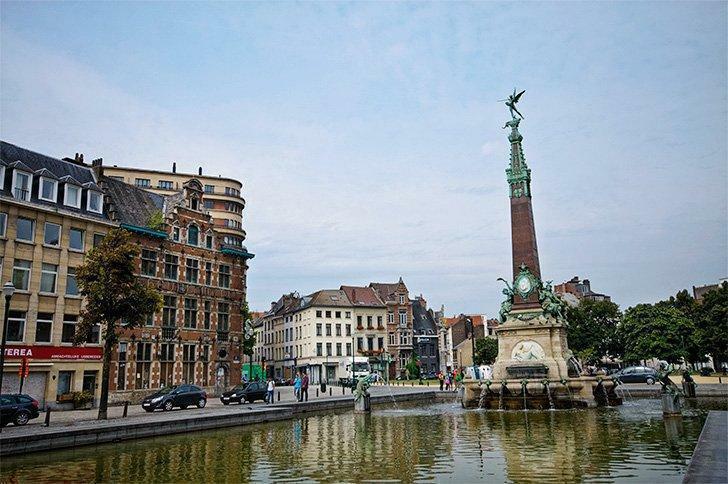 Located in Brussels’ Etterbeek neighbourhood, you’ll experience living like a local while being near Parc Cinquantenaire and its numerous museums. You’re also beside the lively Jordan area, filled with great restaurants and Brussels’ best frites. Breakfast is made of locally sourced and organic ingredients with vegan and gluten-free options available. Click here for the latest prices. ApartHotel MAS Residence (See Business Hotels) This hotel is not green-key but is part of the TripAdvisor Green Leaders program. When we’re not trying to rack up customer loyalty points at our preferred hotel chains, we usually opt to stay in boutique hotels, and I’m always on the hunt for hotels with great design. Brussels has plenty of both with small, family-run boutique hotels and fun, funky, arty design hotels. We’ve put these two categories together as most of the following hotels belong to both. If you love art and bold design, Hotel Bloom is the perfect accommodation. It’s bright and modern and has a fantastic restaurant, but the most interesting thing is each room has been decorated by a different artist. If you need more temptation, there’s a real waffle truck in the breakfast room, serving up hot Belgian waffles. Located beside the Botanique garden and exhibition space, the hotel is right beside a metro and tram stop, halfway between the Central and North train stations. 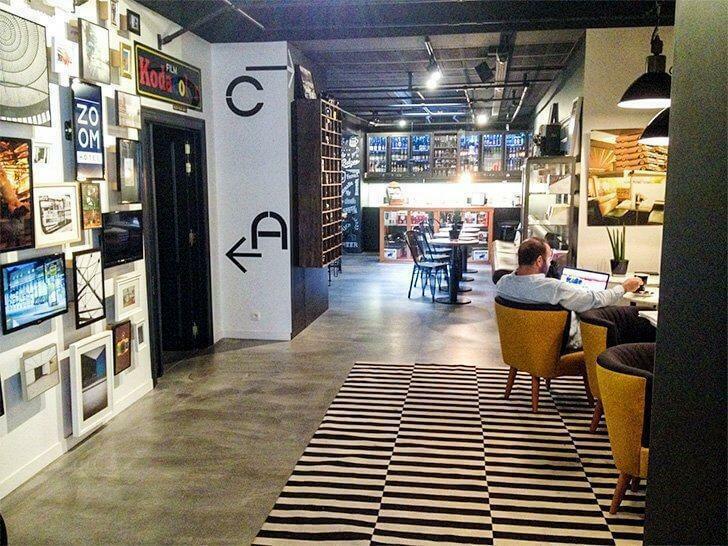 If you are looking for a fun and hip place to stay in Brussels, this is your place. Click here for the latest prices. Thank you for the awesome cover @hotelsofakind ! 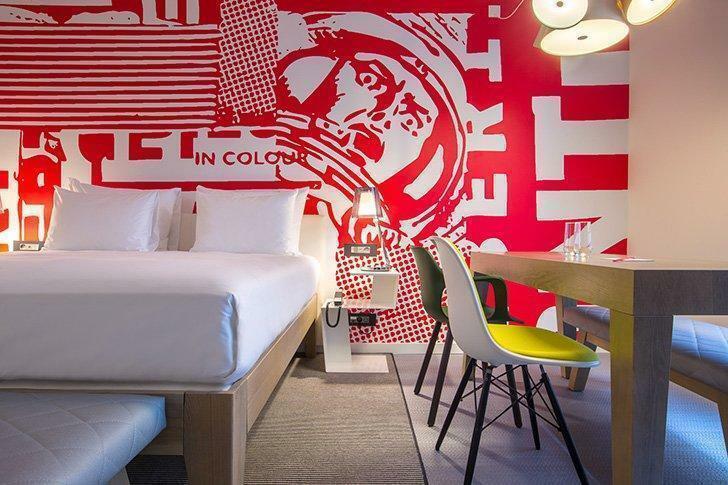 Design buffs, the Pantone Hotel is for you. Each room has a different ‘mood’ based on its Pantone colour. You choose your room via a tablet when you check in. The bold colours contrast with bright white spaces. It’s located between the chic Avenue Louise area and the trendy Chatelain neighbourhood, so you have plenty of great restaurants nearby. If you book in advance, you can snap up some great deals, making Pantone a funky and affordable accommodation choice. Click here for the latest prices. Downsides – Farther from the centre and a short walk to public transport. If quirky and original is your thing, look no further than the Vintage Hotel. This boutique hotel is located near Avenue Louise and has 29 vintage designed rooms. There are fun and funky vintage details throughout the hotel. You can also opt to go Glamping in the heart of Brussels in the vintage airstream trailer! Like Pantone, you can get some great deals if you book in advance. (Note, the trailer has a separate booking page). Click here for the latest prices for rooms or click here to book the airstream trailer. The Augustin is a charming boutique hotel in a former Maison de Maitre (Master’s house) near Brussels’ Midi Station (South Station). Don’t let the classical exterior fool you. The interior décor is thoroughly modern. The breakfast is extensive, and the service is excellent. It’s a good choice if you’re travelling by train. Click here for the latest prices. Read our full review of The Augustin Boutique Hotel. The Jam Hotel in Brussels has family friendly rooms. Kids love the bunk beds! 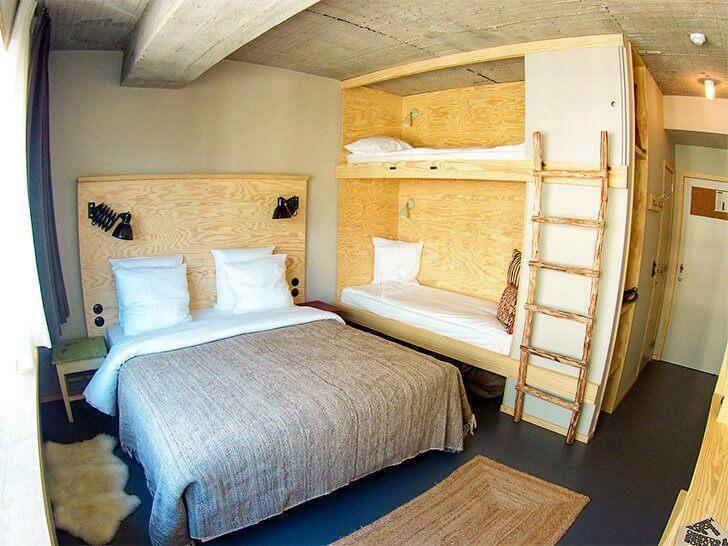 Relatively new on the hotel scene in Brussels, the Jam Hotel is industrial design at its best. Kids love the in-room bunk beds and rooftop pool making it a great choice for families. There are even five and six-person family rooms available for larger groups. For a budget option, snag a bed in the 18 person dormitory. Located in the Saint-Gilles neighbourhood, it’s closer to Avenue Louise than Grand Place but easily accessible by public transportation. There are plenty of great restaurants and hip bars in the area. Click here for the latest prices. Downsides – Farther from the city centre. Industrial décor makes some of the hallways echo-y and a bit noisy. This 3-star boutique hotel in the chic Avenue Louise neighbourhood gets rave reviews from visitors. The staff is excellent, the hotel is both modern and charming, and it offers a variety of comforts you won’t find elsewhere, at least not for the affordable price. Guests can borrow bikes or enjoy billiards in the games room. The hotel is steps from a metro stop with direct access to Brussels Midi Station. There are plenty of excellent restaurants and shops in the area too. Click here for the latest prices. When I stayed at the Radisson RED is was still known as the Radisson EU. It was a fantastic little hotel then, and it’s even better now. The Radisson RED is a brand new line, designed to be both budget-friendly and beautifully designed. The bold colours are hip and trendy, but you still get the Radisson quality service and attention to detail. The RED is steps from the EU quarter and public transportation, and it has an excellent restaurant. Click here for the latest prices. Read our full review of the Radisson RED hotel. Downsides – Farther from the centre (but still walking distance and Place Lux in front of the hotel can be crowded and loud after work, especially on Thursdays. IHG has been our preferred hotel group for years, so we’ve stayed at our fair share of Crowne Plaza hotels around the world. The Crowne Plaza Le Palace goes beyond the standard generic business hotel. It has an excellent restaurant, the rooms are updated, spacious, and modern, and the hotel is close to the Brussels’ business district. If you have time to combine pleasure with business, you’re also walking distance to Grand Place, beside the main shopping street, and you have easy access to trams, trains, and metro. Click here for the latest prices. Read our full review of the Crowne Plaza Brussels – Le Palace. Double the trouble! Register for SPG Double Take by March 15, and your first three stays through April 15, 2017 will earn double Starpoints. Check out spg.com/doubletake to register today! It’s unusual for a business hotel to also fit seamlessly into the design hotel category but Aloft does just that. Located equidistant from the EU quarter and trendy Place Jourdan, this hotel is ideal for business and pleasure. Aloft features clean, modern design, a popular bar and great summer terrace, and is right across the street from a pretty park, while still in the heart of the city. Click here for the latest prices. When you’re travelling for work, often all you want are the comforts of home. Aparthotels are a great option as they offer the freedom to have your own apartment space with many of the services of a hotel. ApartHotel MAS Residence is one of the top rated in Brussels and is conveniently located between the Schuman and Arts-Loi metro stations. This area was our neighbourhood for seven years, and we can attest to it being a great location! There are plenty of shops, restaurants, and services nearby and you’re still close to the city centre. If your work takes you to the EU, you’re steps from the door. Did I mention MAS Residence is a Maison de Maitre? These beautiful buildings from the early 1900s are what make this neighbourhood so atmospheric. You may feel so at home you’ll never want to leave. Click here for the latest prices. We don’t travel with kids (unless you include our four-legged babies) but we have plenty of friends (and CheeseWeb contributors) who do. We’ve learned what parents and children want in a hotel stay. Here’s where to stay in Brussels with kids. Even without kids, the FunKey Hotel is one of our favourites in Brussels, and we recommend it to everyone. 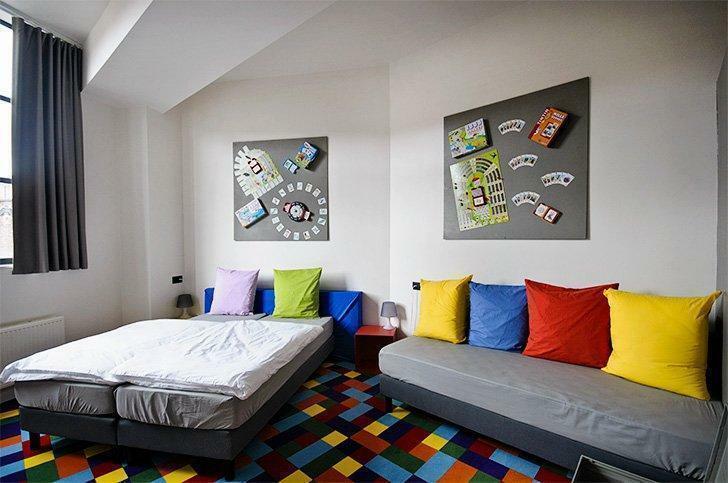 From the bold colours to the board game-themed rooms, FunKey brings out the kid in all of us. The staff and service are fantastic; there are plenty of snacks on hand if your kids get the ‘hangries’ and you can choose from dozens of board games for all ages. There are triple and quad rooms available for larger families too. Located in the lovely Schaarbeek neighbourhood, it’s a bit farther from the city centre, but it’s one of the few hotels with FREE private parking. In fact, prices include everything: wifi, breakfast, snacks… You can even borrow a laptop or mobile phone, making it a great budget option too. Click here for the latest prices. Read our full review of the FunKey Hotel. Aparthotels are perfect for families as they offer the comfort and convenience of home with the services of a hotel. You can easily make the kids a snack in the kitchen and have plenty of space for Mom & Dad to relax. Citadines Saint Catherine is also located in a perfect family-friendly location. The square offers loads of food and shopping options, a metro stop right outside the door, and is a short walk to Grand Place and Central Station. Click here for the latest prices. 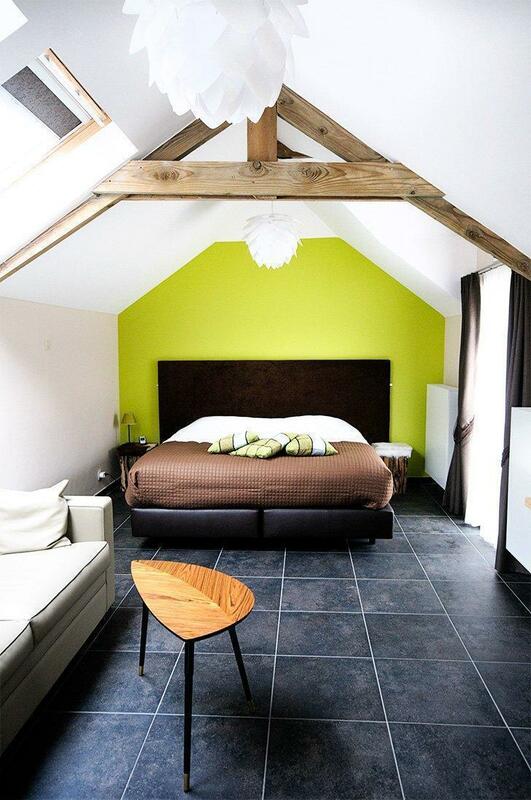 B&B Hippo-Droom is one of the few accommodations outside the Brussels Capital Region we’ve included in this list. However is it close enough to the city and so family-friendly we thought it deserved mention. If you love nature and want a charming, family-friendly option to staying in the city, this little gem in Hoeilaart is for you. There is a restaurant on-site, the rooms are colourful and spacious, with an accessible room available. There’s even room on-site to bring your horse! Plus, you’re just steps from the stunning Sonian Forest. The B&B has plenty of free parking, so it’s a great option if you’re travelling by car. Click here for the latest prices. Read our full review of B&B Hippo-Droom. We don’t think you have to stay in a hostel to have an affordable night’s sleep. (Our dormitory sleeping days are long over.) There are plenty of cheap hotels in Brussels that don’t force you to sacrifice comfort or a good night’s sleep. Many of the hotels we’ve listed above are excellent budget-friendly choices as well. (We’ll list them again below.) However, there are a few other hotels to which we’d like to draw your attention. 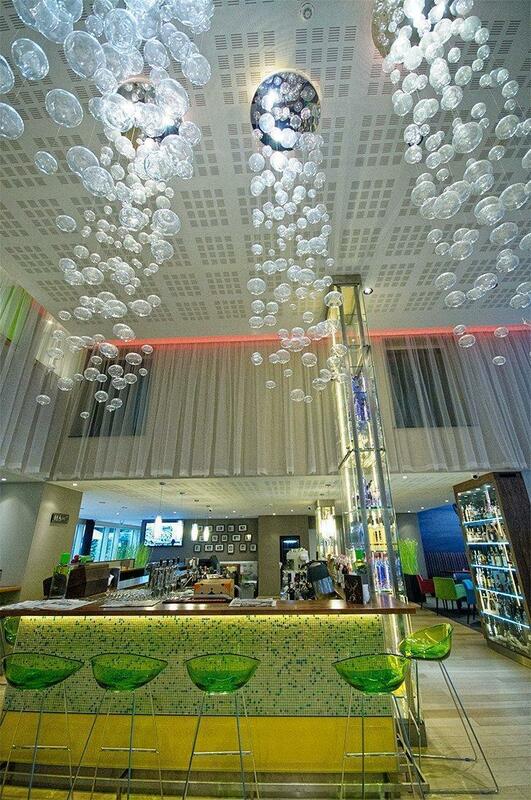 Zoom is a budget hotel in Brussels with a great bar and funky design. This design hotel is vintage chic and close to Avenue Louise. There’s no on-site restaurant, but there’s a wide variety of Belgian beer available in the bar and plenty of nearby food options. The historic building is soundproofed and non-smoking throughout and is staffed by a friendly team. Click here for the latest prices. The German Motel One chain arrived in Brussels a few years ago and proved affordable accommodation can be beautiful too. After staying in their Munich hotel, I was thrilled to see Motel One Brussels appear just steps from the Royal Palace and Museum Quarter in Central Brussels. 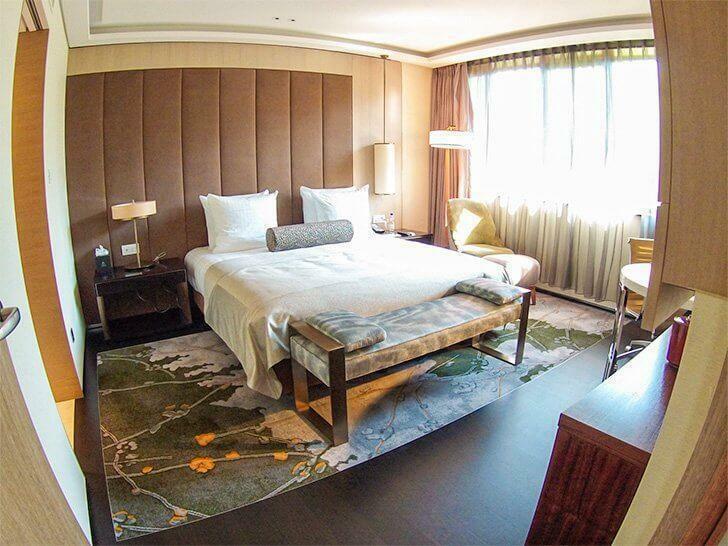 The design is modern and trendy with comfortable room and excellent service – German efficiency at its best! Click here for the latest prices. Let’s be honest, in general, neighbourhoods around train stations can be sketchy, and Brussels is no exception. However, that doesn’t mean your hotel has to be. If you’re travelling to Brussels on an international train like Thalys, Eurostar, or ICE, you’ll be arriving at Brussels Midi Station (also known as Brussels South or Zuid). If you’d like a hotel close to the station, there are a few excellent (completely non-sketchy) options. You can’t get any closer to Brussels Midi Station than the Hotel Pullman – It’s in the station itself. But rather than being noisy, this modern, design hotel is an oasis of calm and full-service luxury at a reasonable price tag. Hotel Pullman offers a full restaurant and bar, a fitness centre with a spa and sauna, and over 60 free movies to enjoy. You’re a 15-minute walk to the city centre or hop on the train or metro in the station and be at Central Station in minutes. Click here for the latest prices. Run by the same local hotel chain as luxury Hotel Manos Premier, Be Manos offers a more modern design steps from Midi Station. The hotel offers excellent, friendly service, family rooms, and a full-service spa. The bar offers light meals and caters to special diets on request, and the hotel can even provide shuttle service to the train station on demand. Click here for the latest prices. If you need convenient access to Brussels Airport, you can’t get any closer than the Sheraton. This four-star hotel is just outside the airport’s front entrance and has everything you expect from a luxury hotel chain. The rooms are sound-proofed, so you don’t have to worry about noise from the airport. There is easy access to the city via the train station in the airport’s bottom level. There are even plenty of dining options in the hotel for those late-night arrivals. Click here for the latest prices. Crowne Plaza is our go-to hotel chain if we’re looking for an airport hotel. We stayed at the Crowne Plaza Brussels Airport numerous times when we were in the process of moving to Brussels. It’s near enough to the airport that it’s convenient for catching that early flight (they provide a free shuttle service) but it’s also close enough to the highway, NATO, and city centre. 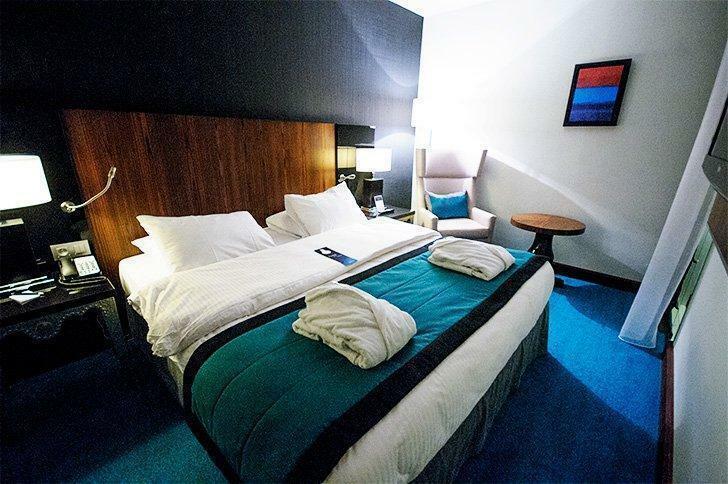 It’s an excellent option for business travellers, but the hotel also offers family rooms so it can be a good choice for families visiting Brussels by car. Click here for the latest prices. For something a little more charming and personal, but still near the airport, try B&B Landing Point. Just a 10-minute drive from the airport, this bed and breakfast gets rave reviews. 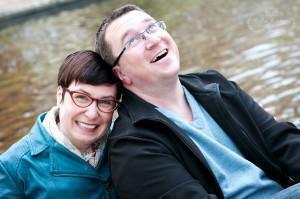 They provide a free shuttle service, luggage storage, and free parking. You get a friendly, countryside experience with all the convenience of being close to Brussels airport. Click here for the latest prices. Where else besides Belgium can you stay in a castle, surrounded by a top-rated spa, only 5 miles away from the airport? Did I mention the room rates are a bargain? Thermae Boetfort is our favourite spa in Belgium, and it’s close enough to Brussels International Airport to make it a viable airport hotel option. There’s loads of free parking, an excellent restaurant, and the spa experience is unlike any other. Plus, your friends will be super jealous. There are no downsides here. Click here for the latest prices. If you’d like to see exactly where each of the hotels is located, check out the map below. 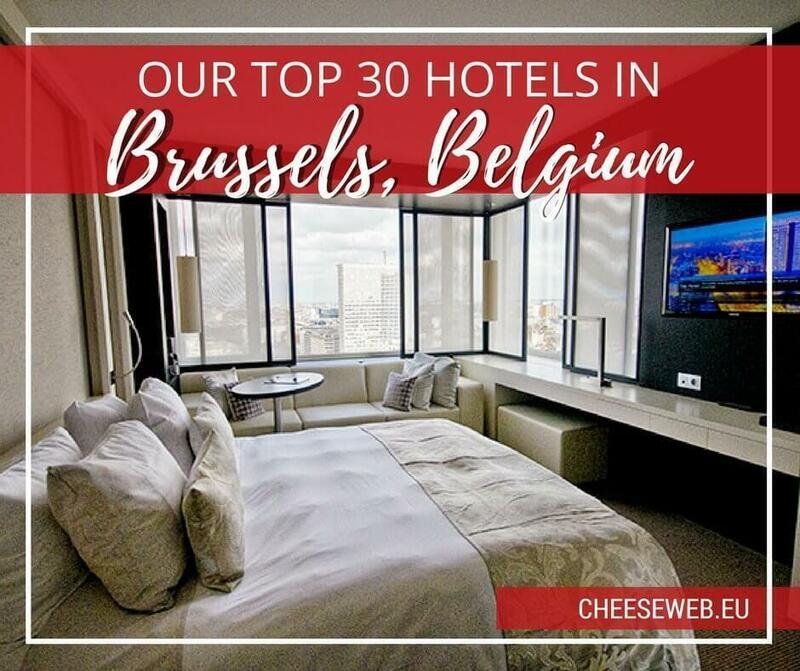 We hope this round-up of our top 30 hotels provides you with the perfect place to stay in Brussels.